The word ‘positive’ is crucial to the service we provide for families at our Swan Family Contact Centres, where the children have been placed into care. Up until this point, the families experience in life would probably be described as ‘negative’. Our Contact Centres are the first step towards a brighter new future for both the children and their families. Positivity is paramount to the process being a success. A positive contact experience does not happen by accident; behind each contact session, a very careful planning process has taken place. The word ‘positive’ is crucial to the service we provide for families where the children have been placed into care. Up until this point, the families experience in life would probably be described as ‘negative’. Our Contact Centres are the first step towards a brighter new future for both the children and their families. Positivity is paramount to the process being a success. A positive contact does not happen by accident; behind each contact a very careful planning process has taken place. In most cases, families are referred to us by a Social Worker after the breakdown in the parents’ ability to keep their child safe. For the child, this is an anxious time where everything they had known has been turned upside down. Therefore it is essential that our Contact Centres offer warmth and safety with the real possibility of new beginnings. Our Contact Centres represent the start of a positive new future for our families, without judgement. A Supervised Contact is not always an easy situation for people to be in or understand. Imagine carrying out a routine task that requires little or no thought, and imagine this again with the pressure of a stranger observing you completing this task. It would be a daunting prospect for many of us, feeling ‘under the spotlight’ in this way. This could make you feel uncomfortable, uneasy, or even angry. Our centres are designed to take these feelings and pressures into consideration. 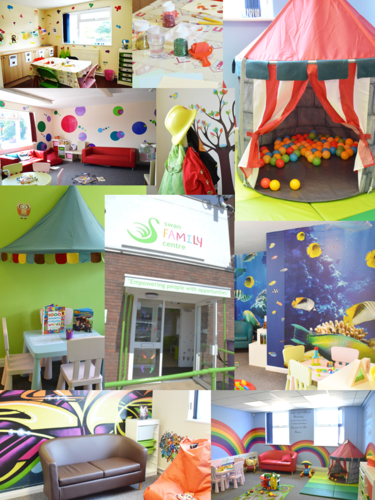 Our Family Contact Centres are managed by competent staff who have extensive knowledge of the development of children. They also have the awareness of the possible psychological effects both the children and families may be experiencing, and the ability to empathise with them. Although we may not be able to directly relate to each individual situation, we do our best to pre-empt any signs of negativity during each contact, as this is a very emotional time for families. Our Family Contact Centres are tailored to meet the needs of our families. Rooms are themed and provide scope for the families to relax, play and enjoy their time together. Each room is designed with families and their needs in mind, offering different backdrops to spark imagination and enthusiasm. They are also designed to give each family the privacy they deserve during their time together. All of our contact rooms have comfy sofas and bright décor that creates an ambiance of fun and positivity while families can enjoy valuable time together. There is at least one shared kitchen at each of our Contact Centres providing an opportunity for families to share a meal together. Meal times are an important social time for families and we positively encourage baking, cooking and eating together to help build broken bonds. These meals can be eaten within the kitchen, or taken to the contact room you are utilising for privacy. Each Contact Centre is equipped with games for all age groups from very young children to young adults. They are yet another opportunity to focus on activities that promote sharing and conversation during the contact experience. We are dedicated to providing positive experiences for the families who visit us by providing a welcoming, bright environment where everyone is treated with respect. When so much negativity has been experienced, we pride ourselves in making the difference in the lives of the families we support. The bright chairs, decorative walls and a warm greeting offered by a member of our dedicated team, welcome you to our Contact Centres. Prior to your first visit, each family’s needs will have been carefully assessed and a contact tailored to them will have been planned. Behind the transition from reception to a private room there has been a wealth of thought by our experienced Managers and Social Workers. Each room has a different theme and you could find yourself transported to any number of new worlds within the Contact Centre, each providing a safe and happy environment. Our first room ‘Lots of Spots’, is a good ‘all round’ room that lends itself to larger family groups and with its own kitchen just next door and a large table it is ideal for a family meal to be eaten around or maybe a board game to be played upon. For the teenagers our ‘Graffiti’ room is a space with bright, bold graphics on the walls and comfy beanbags to relax on. The ‘Over The Rainbow’ room invites you to a world where the colours aren’t limited to seven. There is room to share a book on the sofa or on the beanbags. ‘Monkey Magic’ is a room for our younger visitors with an array of toys and activities that will keep even the hardest to please occupied. ‘The Owls Nest’ is a room designed with our baby visitors in mind, where plush comfy play mats litter the floor invitingly and soft music plays from the hanging mobiles to create peace and tranquility for babies and their family to relax in. And last, but not least, grab your flippers and snorkel and dive into ‘Sea World’, a fantastic room that creates the feeling of truly being under the sea without water. Tropical fish swim leisurely across the walls, and the comfy sofas make a perfect resting place to reflect. All of these different ‘worlds’ offer a different experience but with several things in common, they are all comfortable, warm and bright. ‘Have Hope, Be Strong, Laugh Loud and Play Hard, Live In The Moment, Smile Often’ is just one example of the inspirational messages across our walls. Our Contact Centres are designed to offer the security our families need as they take their first tentative steps forward, adjusting to the new life ahead. It is with pride that we take these steps with them and make the time they share together the best and most positive it can be.